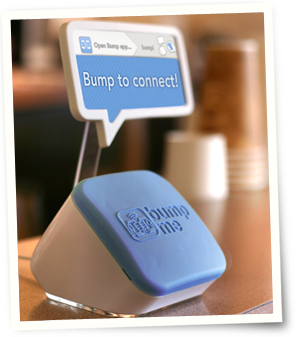 Can The Bump Cube Connect Merchants And Consumers (While The Company Collides With Cash)? What’s the future of Bump? The popular iPhone and Android app, which enables users to share media simply by “bumping” smartphones together, recently hit 63 million downloads. Now it’s time to monetize. What’s the future of Bump? The popular iPhone and Android app, which enables users to share media simply by “bumping” smartphones together, recently hit 63 million downloads. It’s likely one of the few social networks that’s actually social, requiring physical interaction to work in most cases, with users sharing everything from contacts to apps to music to pictures (close to 2 million photos are bumped over the network per day). The potential here, Lieb promises, is great. He gives me a sense of the various areas the Bump team is exploring. “Imagine [businesses] having a little device that they can put on their counter,” Lieb says. “When customers Bump it, it would give them contact information, or maps or directions, or maybe lets them set up an appointment for next time.” He ticks off a list of other ideas: maybe it could pull up a menu in a restaurant, or assist with payments in an increasingly NFC world. In other words, you might soon be Bumping to check into Foursquare at a local merchant, rather than pulling up the app itself and manually punching the buttons. “I think we’re the only company in the world that is able to create friend connections on Facebook. You and I can Bump, and we can actually become friends without ever touching Facebook,” Lieb says. Imagine, then, if you could simply Bump your phone at a merchant’s kiosk to “Like” it on Facebook or follow it on Twitter? That, he believes, is something merchants would pay for. And they might even pay Bump.